All Gallery experiences are based upon a template. When you create a new experience, the first step is to select a template to use. The template controls the overall layout and styling of the experience. Over time, new features and enhancements may be made to templates by Brightcove. Brightcove will not push major template updates out to exiting experiences. Publishers are responsible for upgrading their experiences to use new templates and then for testing before publishing. Note: This topic applies to Portal, Landing Page and Event experiences only. If you have any experiences that require template updates, a banner will be displayed at the top of the page when the Gallery module is opened. Click the link to display only the experiences that require template updates. The filter at the top of the page can also be used to display the experiences that require a template update. 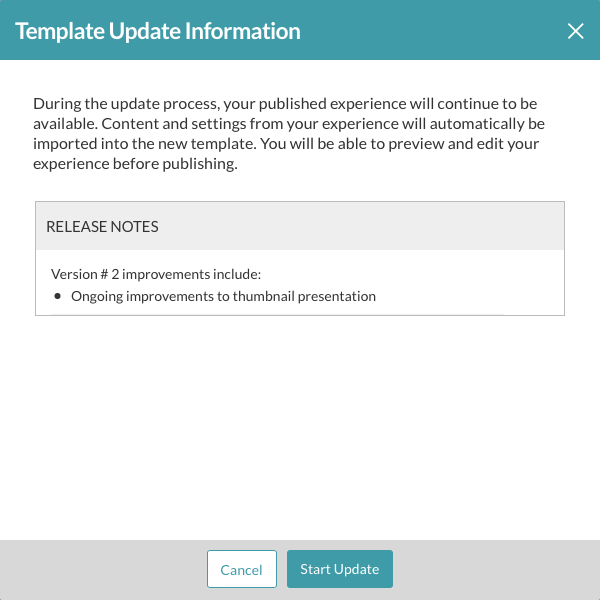 All experiences that require a template update will display a Template Status of Needs Update. Note: It is possible to have experiences using different versions of the same template. 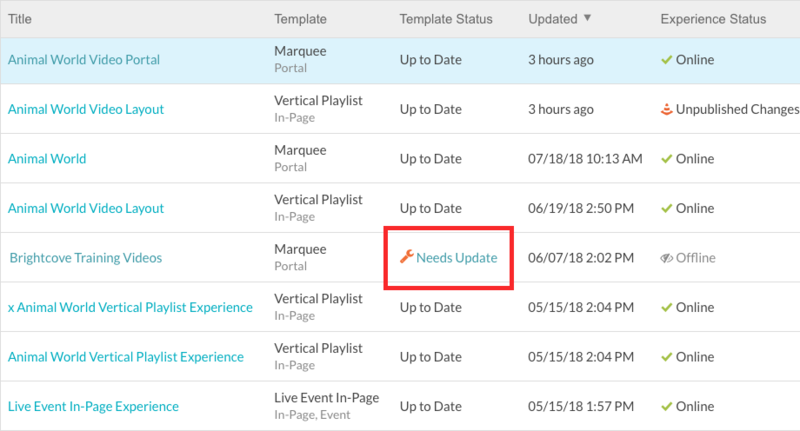 For example, when an update to the Marquee template is available, the Needs Update status will only appear on Marquee sites that require a template update. You may have other Marquee sites that were built using the latest version of the Marquee template that do not require an update. For information on the template update, click the View Details link on the right side of the page. Clicking the link will display a dialog with the template update details. Click Cancel to close the dialog or Start Update to begin the template update. To update a template, follow these steps. Click the View Details link to review the changes to the template. Note: You may see a Template Status of Resume Update if the template update has been applied and the experience hasn't been published. Click Start Update. The template update will be applied to the experience and the Gallery Site Editor will open. 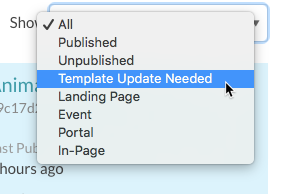 Note: You may see a Template Status of Resume Update button if the template update has been applied and the experience hasn't been published. (Optional) Click the discard the update link or Discard Update button to discard the template update. To publish the site with the updated template, click Publish. Once the site is published using the updated template, there is no way to access the older template. Click the discard the update link or Discard Update button to discard the template update. You will be prompted to discard the update. Click Discard Update to revert the site back to using the older version of the template. 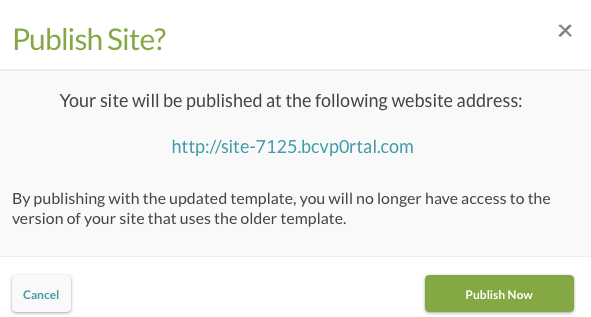 Note that Brightcove recommends updating to the latest version of templates. If you discard the update, at some point, older versions or templates will not be supported by Brightcove.